The village pond is in the middle of the village, on the site of the old village pound. The Parish Council is responsible for maintaining the pond and the surrounding area, which is cut regularly as part of the village maintenance schedule. 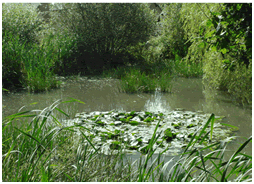 The pond is home to the Great Crested Newt, among other wildlife. The Parish Council obtained a grant from Hampshire County Council, under their Small Grants Scheme, which provided half the funding for a replacement bench and an interpretive map board to be sited at the pond. The remainder of the funding came from the "S106" money obtained when Palmer's Yard was developed. The Parish Council actually has little information on the history of the pond so if anyone knows more about it please contact the Parish Clerk.